Description: Decumbent perennial herb; stems weak, often trailing to 30 cm long, scabrous with short, recurved hairs to glabrous, internodes 4–7 cm long. 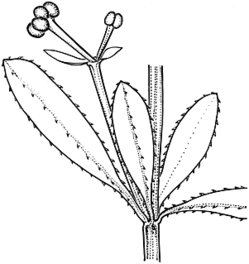 Leaves and stipules, ± unequal in whorls of 4, linear to oblanceolate or narrow-elliptic, mostly 10–20 mm long, 2–5 mm wide, apex obtuse to acute, midrib narrow, lamina ± scabrous; petiole conspicuous, c. 3 mm long. Flowers in terminal cymes on slender peduncles, 1–7 mm long, c. 4-flowered. Corolla white, fragrant, 1–1.5 mm long. Fruit c. 1 mm long. Distribution and occurrence: Grows in damp sites often along river banks; from Taree to Bulahdelah, rare.